What is SysTools Mail Migration Wizard? SysTools Mail Migration Wizard is a comprehensive migration tool that lets users export and convert NSF files. This software allows businesses to recover emails and other data from Lotus Notes and Domino Server to MS Exchange, Office 365, and Outlook. It makes the process an easy one and ensures that no relevant data is missed during the file transfer. Aside from exporting mailbox information, SysTools Mail Migration Wizard also maintains the same folder hierarchy. This means that mailboxes retain their hierarchy even after the migration. With SysTools Mail Migration Wizard, users can swiftly conduct batch migrations. The solutions graphical interface lets them convert multiple NSF files at one time. On top of that, various filters can be applied to make certain only wanted or needed data are transferred. SysTools Mail Migration Wizard helps businesses transfer data from Lotus Notes and the Domino Server into three email clients. These are MS Exchange, Office 365, and Outlook. This lets businesses save on migration costs, as it already supports three platforms. During the migration process, SysTools Mail Migration Wizard prompts users whether they want to keep calendar recurrences or not. By choosing to keep this data, users can maintain their organized calendars and ensure they do not miss important deadlines or events. SysTools Mail Migration Wizard enables users to decrypt encrypted files during the conversion process. This lets them transfer secured files to their new email client seamlessly. However, this is an optional feature and users can choose not to use this. Businesses are likely to have a plethora of mailboxes and folders. To ensure that no file or folder is left behind, SysTools Mail Migration Wizard is equipped with a batch migration wizard. This lets users convert several Lotus/Domino data in one go, letting them save time. In case some files and folders are no longer needed, users can simply apply filters to exclude these data. This reduces the migration time and makes mailboxes less cluttered in new email clients and servers. With SysTools Mail Migration Wizard, users need not worry about not being able to keep track of their unread messages. That is because the software ensures that mails retain their read/unread statuses once they have been exported. What Problems Will SysTools Mail Migration Wizard Solve? SysTools Mail Migration Wizard assures IBM Domino users that they can transfer their data to the Microsoft Exchange server intact. They can also rest assured that they can migrate their encrypted files, should they wish to do so, although the software will have to decrypt them first. Due to the rising popularity of cloud storage services, IBM Domino users are looking to export their data to Office 365. However, many of them are unaware of how to do so. That is where SysTools Mail Migration Wizard comes in. The software makes sure that not only the files are transferred completely, it also ensures that the file internet header is intact. SysTools Mail Migration Wizard can assist users in transferring their Lotus Notes data to Outlook. The solution not only migrates emails, it also supports the conversion of calendar, contacts, and other data to ensure that there is no loss of information. Since each enterprise has specific business requirements, it is sensible for them to refrain from looking for a one-size-fits-all perfect software application. Needless to say, it would be useless to try to find such an app even among popular software platforms. The smart thing to do would be to catalog the various essential elements that require consideration such as main features, finances, skill levels of employees, company size etc. Then, you should do your research thoroughly. 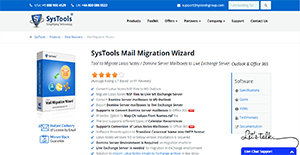 Read some SysTools Mail Migration Wizard reviews and look into each of the other systems in your shortlist in detail. Such in-depth groundwork can make certain you discard ill-fitting systems and choose the app that provides all the features you require for business success. How Much Does SysTools Mail Migration Wizard Cost? SysTools Mail Migration Wizard offers three SMB and enterprise pricing packages for users to choose from. Give the details a look, and select the best plan for your business. We realize that when you make a decision to buy Email Management Software it’s important not only to see how experts evaluate it in their reviews, but also to find out if the real people and companies that buy it are actually satisfied with the product. That’s why we’ve created our behavior-based Customer Satisfaction Algorithm™ that gathers customer reviews, comments and SysTools Mail Migration Wizard reviews across a wide range of social media sites. The data is then presented in an easy to digest form showing how many people had positive and negative experience with SysTools Mail Migration Wizard. With that information at hand you should be equipped to make an informed buying decision that you won’t regret. What are SysTools Mail Migration Wizard pricing details? What integrations are available for SysTools Mail Migration Wizard? If you need more information about SysTools Mail Migration Wizard or you simply have a question let us know what you need and we’ll forward your request directly to the vendor.